1. Place tequila, Controy and lime juice in blender. 2. Fill until almost full with crushed ice. Shake well or blend until very slushy. 3. Wet rim of martini or Margar ita glass with water and swirl in small dish of salt. 4. Pour Margarita into the glass. Ole! 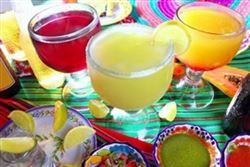 Enjoy this delicious authentic Margarita Mexican food recipe!